Love soda but know you need to not drink quite so much of it? Check out these 5 healthy alternatives to soda that will help keep your taste buds happy. Growing up soda was always available in our house. My parents were diabetic so it was diet soda but I still got very used to drinking multiple sodas daily. I still love soda to this day but I do try to drink it as more of an occasional treat. When I do drink soda I also look for brands with few ingredients and real cane sugar. It honestly took me a long time to make the transition to go from drinking a lot of soda to healthier beverages. 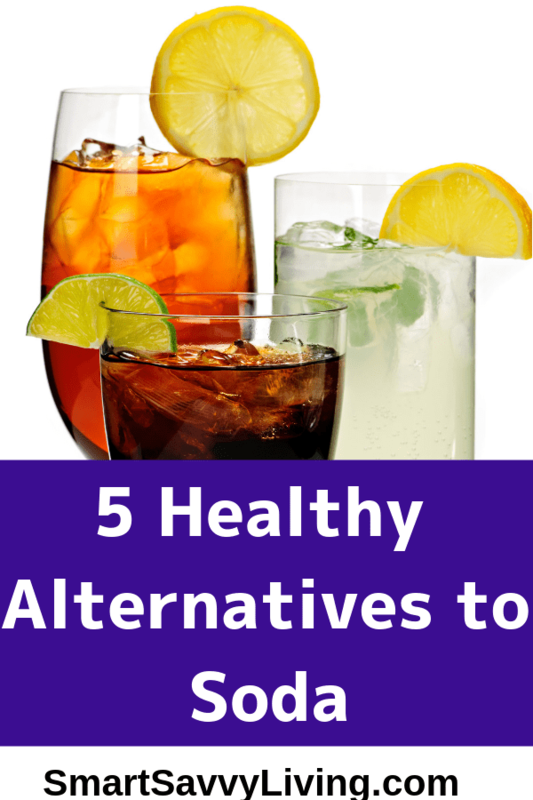 These 5 healthy alternatives to soda help me to keep my bad soda habits in check. We all have our own personal reasons we want to stop drinking soda. Here are some reasons why it’s healthy to stop drinking soda. The sugar, acidity, and carbination can be bad for your teeth. Soda isn’t cheap – you’ll have more room in your budget. You may lose weight by consuming less sugar and calories. You may have less waste by not having the cans and/or bottles. You may lessen your chance of developing insulin resistance by consuming less sugar. A lot of people tend to crave sugar less overall when they stop drinking soda. I personally wanted to stop drinking soda regularly because I needed to stop consuming so much sugar to help lower my blood sugar. In doing so, I also decreased how much I crave sugar. I also wanted to not drink so many of my calories. No matter your reason for wanting to drink less soda or stop completely, remember it’s usually a good idea to take things slowly. Consider slowly opting for these healthier alternatives to soda versus quitting cold turkey. If you stop suddenly you may struggle with extreme cravings and even headaches from the lack of caffeine and sugar. 1. Water – I know this is the “well, duh” answer but water is one of the healthiest and cheapest things you can drink. I know several people who drink little if any plain water because all they drink is soda. I used to be like that myself. However, over time I slowly increased how much water I drank and now it’s my preferred drink of choice. That’s something I never thought would be for me. 2. Tea – Tea is my favorite flavored beverage of choice these days. There are so many types and flavors, and with and without caffeine, so it’s hard to get bored. If you can stand to drink it unsweetened, it’s even healthier, but even if you must add sugar at least you’re doing so without unnatural sweeteners, dyes, etc. I’m from and still live in the south so I know how hard it can be to drink unsweetened tea. But, I gradually cut back on how much sugar I added and now I love unsweetened teas. You can also use more natural sweeteners like honey, stevia or xylitol. If you do use xylitol be careful of having it around your pets, especially dogs, because it can quickly be deadly for them if they consume it. If you need a caffeine fix, black and green varieties usually contain caffeine and also healthy antioxidants. If you prefer to leave the caffeine behind there are also several herbal teas, like my favorite, peppermint. 3. Coffee – It seems like every year there’s a new study out on whether coffee is good or bad for you. I don’t really side one way or the other. I do usually prefer tea over coffee, anyway. However, sometimes I just need a good dose of caffeine to get through the day and enjoy iced coffee throughout the year. Since I would usually turn to cold soda instead, I now opt for iced coffee with a bit of vanilla, honey, and milk or cream. I love my flavored coffee drinks, but you do have to be careful as they can contain just as much, if not more, sugar than soda if that’s a concern for you. 4. Make it Sparkly – Almost everything is better sparkly, right? One of the biggest things that has helped me stop drinking so much store bought soda is to make my own homemade soda. I’ve grown to really like just plain carbonated water. When I first started the soda transition I really needed something flavored, though. I’d sometimes make a lemon or mint simple syrup. Other times I’d add a touch of fruit juice or tea. I also really like the True citrus flavor packets that come in a variety of flavors like lemon and orange without being sweetened. You can buy seltzer water relatively cheaply but I also like using our SodaStream to carbonate the water to my liking. 5. Better Store-Bought Choices – At some point, we’re all out and about with friends and family, on the road, etc. This obviously makes it tougher to control the types of beverages available to us. In these cases I like to compromise with healthier choices that I can still enjoy. I really like flavored sparkling waters that have no sweeteners added. Lidl has a great variety that is really affordable. Trader Joe’s does as well, though it is a bit more expensive. Another favorite is an Arnold Palmer made with unsweetend tea and lemonade. There are lots of great options out there just take a moment to look at the ingredients that are important to you. What are some of your favorite healthy alternatives to soda?